The Pan-Tilt Head With CB Quick Release from Custom Brackets is a lightweight, compact pan and tilt head that's designed for use with long lenses, cameras or brackets. 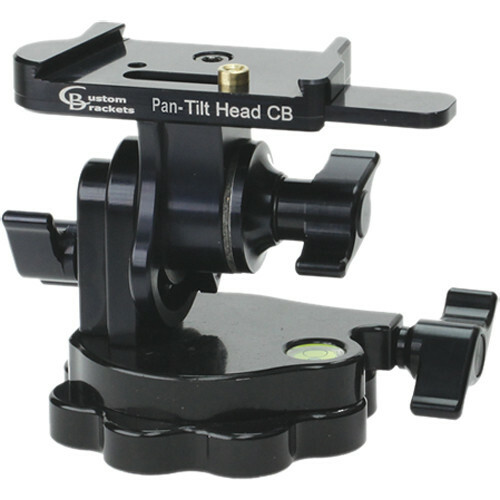 This black anodized aluminum head can be used with any tripod and has a panning base built in. It's easier to tilt than a ball head, and requires no lubrication, making it maintenance-free. It has captive aluminum clamp, pan, and drag knobs, and a built-in bubble level, for a fast and simple set-up. It has a Custom Brackets quick release for fast set-up and storage. Box Dimensions (LxWxH) 5.7 x 5.3 x 4.4"